In 2005 I undertook my very first field study assessing whether a one-off control program could reduce red fox density on an agricultural property in NSW. Despite my efforts of removing 47 foxes in 12 nights, the control program only reduced the fox population by 1 fox per square kilometre. This was my first introduction to the difficulties of managing invasive species and it provided my first lesson on how not to control foxes! The work is now finally published and hopefully the paper demonstrates that isolated and uncoordinated efforts to control foxes are not effective at reducing fox density. Below is a copy of the abstract. Click HERE for a link to the paper. As a side note, an additional component of the project involved radio-tracking foxes that I had caught and released with VHF collars. Back in those days GPS collars were not available. 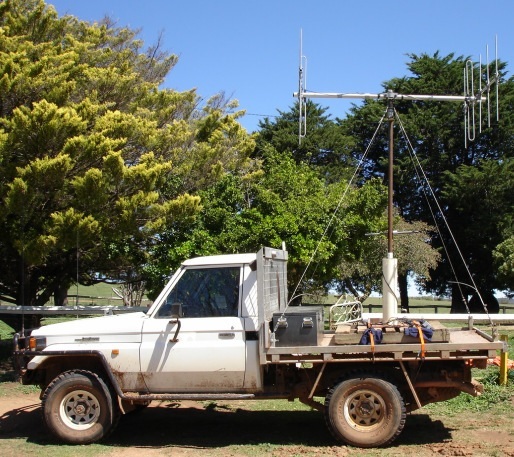 I spent many late nights tracking the foxes and I thought a few people might appreciate the picture below of the Toyota Landcruiser I modified to allow for radio-tracking via a large antennae that was installed in the tray. Abstract: Uncoordinated and isolated control programs are often used by land managers, property owners and recreational hunters to control numbers and reduce the impacts of European red foxes (Vulpes vulpes). However, decades of such attempts to eradicate this significant agricultural and biodiversity pest in many countries have failed. We investigated the effectiveness of an uncoordinated and isolated shooting program to determine if it caused any change in red fox population density. We also determined whether shooting is more cost effective than poison baiting for fox control. First, we estimated the density of foxes on an agricultural study property using distance sampling and rates of bait uptake before and after a control program. Second, we estimated the costs associated with undertaking the control program and compared it to the estimated costs of undertaking poison baiting. Prior to control, we estimated a density of 4.18 foxes per square kilometre. After the control exercise, which removed 47 individuals in 12 nights, we estimated a density of 3.26 foxes per square kilometre. Our results provide evidence that one-off control programs are not effective in greatly reducing red fox density, even if the control effort is intensive. Where large-scale control programs cannot be coordinated, isolated programs should therefore involve follow-up campaigns to reduce population recovery. On a local scale, combinations of shooting and baiting may also provide maximum control impact at minimal cost. Perhaps the most mystic – and most feared – wildlife in Canada, wolves are making a comeback. Throughout the western United States, wolf populations are beginning to re-emerge after a courageous plan to reintroduce them to Yellowstone National Park in the 1990s. But along with their reintroduction has come ongoing fear, paranoia from ranchers and the happy trigger fingers of hunters and trappers. Add that to the ongoing persecution of wolves in Canada and the species is by no means free of their one-time endangered status. But this has also created an unique and historic opportunity to study wolves and how they affect ecosystems. Two recent studies have identified and are extrapolating what is becoming known as The Wolf Effect. We’ll hear from two leading scientists who have examined this phenomenon; first is Dr. Thomas Newsome, who has worked with a team that is exploring how wolf populations affect the populations of foxes and coyotes. Then we’ll be joined by Dr. Mark Elbroch, who is part of one of the longest-standing cougar studies in North America and has fascinating details on how wolves are impacting cougar populations and territory selection.